Winter is just around the corner. Our fleet is stacked neatly in the boatyard on Canal Street. We can forget about sailing and Sail Chicago for the next few months. Or can we? Remember, as a community sailing program, we are an all-volunteer organization. The main reason that we can offer such uniquely affordable instruction and sailing opportunities to our members and others in the Chicago area is that our dedicated members put in countless hours of service staffing our instruction programs, performing administrative roles, and now most importantly, maintaining our fleet so that future members and students will be able to enjoy sailing on our beautiful Lake Michigan. It's during the late fall and early spring months that a great deal of this maintenance work is performed. Patching, repairing, and cleaning our boats and rigging, sorting and repairing our sails, and insuring that each boat is provided with the necessary safety equipment are just a few of the important maintenance tasks that will be carried out. As members of Sail Chicago, we all pitch in to help with some of these and other tasks. That's why we have an annual service requirement built into our membership program. While new members don't have a service requirement in their first year, they need to have signed up for an activity that will fulfill the requirement by the beginning of the next sailing season if they wish to participate in any on-the-water activities. Returning members in their third year and beyond must have fulfilled their service requirement by the start of the new sailing season. For our newer members, a great way to fulfill your service requirement is by becoming a member of a Boat Team. Here you will be part of a team of 5 -7 members who are responsible for keeping one of our boats in tip-top shape for the sailing season. You'll work on the boat during the fall and spring to prepare it for the next sailing season, and you'll help with minor repairs during the season itself. You're also eligible to participate in weekly "maintenance cruises" with other boat team members throughout the summer. It's a great way to learn about all of the things that go into boat maintenance, and also an opportunity to meet other enthusiastic sailors in Sail Chicago. To find out more, please contact Tom Peterson, our Maintenance Coordinator, or to see other opportunities to meet your service requirement, see the article below. Join fellow sailors to celebrate another great sailing season with a delicious dinner on the lake at the Columbia Yacht Club. After dinner we will recognize the excellent efforts of our members and students who have helped Sail Chicago thrive. The event will be held on Friday evening, November 18th starting at 6:30 with a cash bar. 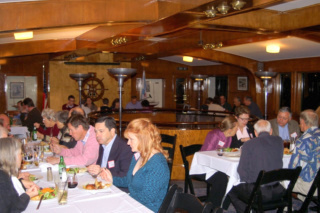 A delicious buffet dinner will be provided by Columbia Yacht Club which is well known for its fine dining. The menu includes a salad, Amish roasted breast of chicken with field mushrooms, seasonal ravioli, fresh vegetables, roasted potatoes, rolls, assorted gourmet cookies and coffee and tea. Cost: $30 per person (includes tax and gratuity). Parking is available in the DuSable Harbor lot just west of the yacht club. To register and pay by November 12th, click here . Space is limited, so sign up soon. numerous boats, the purchase of Calypso was approved by the Board. 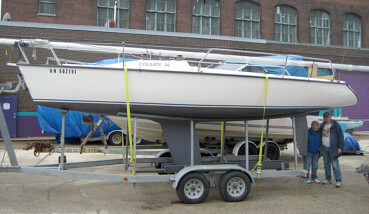 What attracted the committee to Calypso was the high quality of construction and excellent condition of this used boat. Virtually no problems were found during survey. The boat is about the same size as our Hunter 34, but it has a fin keel and weighs 1200 pounds more--it is solid. Harbor at 2500 rpm and made 6.5 to 7 kts, completing the voyage in a little over 4 hours. In 10 kt breeze, with full main and genoa, Calypso made 6.5 to 7 kts. On a windier day, with a 15 kt breeze, with a reefed genoa and a full main, we consistently made 7 kts with a 15-degree heel that was very comfortable. Reefing the main is a snap because all the reefing can be done from the cockpit. The dodger was also very helpful coming down from Waukegan with the temperature at 38 degrees. More fun is certainly in store next season as we put the asymmetrical spinnaker through its paces. The maintenance crew, led by Simeon Stairs, is winterizing Calypso and determining the improvements to get it ready for the 2017 season. Come check it out next season. A RECORD NUMBER OF NEW SKIPPERS! Many hearty thanks to our team of amazing Instructors and to our Check-Out Team of Marj Benson and Alex Pedenko whose dedicated work helped our group check out 42 new Colgate skippers this year. This number is nearly double most recent previous years and all 42 skippers are new to our organization. Welcome to all the new skippers! We remind them to re-read the "Keelboat Skipper Personal Statement" that they signed when they passed the on-the-water part of our skipper requirement tests. That statement emphasizes following the directives in the Sail Chicago Rules and Regulations handbook so that they can continue to learn and enjoy many, many years of growth as a sailor and skipper. like to take this opportunity to thank each of the 13 Sail Chicago members who generously volunteered their Wednesday afternoons to share their love of sailing with these deserving students. The response from the Schüler Foundation has been overwhelmingly positive. With the continued support of the Sail Chicago Board of Directors, we hope to expand the program to provide more enriched sailing experiences for these young scholars. A GREAT SAILING LESSON! Viva el barco de vela! Thank you to everyone who has been working this season to make the organization run effectively. Now it's time to put the boats to bed for the winter, and we need all the help we can get. If you need service time, you can sign up for a boatyard team. But, even if you are set with your own service time completion, we could still use your help. Please contact Tom Peterson and/or watch for announcements regarding when the work is being done (see "Haul Out..." article in this issue). Below is the list of positions that still need volunteers. *Assistant Coordinator: Helps the coordinator manage boat maintenance. Active participation completes service time. *Repair specialties: Specialists will be called on when needed. Active participation completes service time. Getting Her "Shipshape and Bristol Fashion"
Secure the wand to the port foredeck. If it's on the starboard foredeck, people entering or leaving the boat may step on it and break it. Secure the traveler to port for a similar reason. It gives the people coming on board or leaving the boat more room to step out of the way of the next person, a big plus if the boat is rocking. Fully complete both the pre-sail and post-sail checklist, noting any items that need attention. This checklist provides you with a multitude of good reminders and alerts you to any problems with the boat. It also serves to notify future skippers of problems. When unfurling the jib, make sure to keep some tension on the furling line by letting it run through your hands. If you don't, the line may wind itself back on the furling disk and get tangled. If this happens, you'll have a really tough time furling the jib again at the end of your sail. When you leave the boat take another look around the cabin to make sure that no items, including any garbage, are left behind, and that gear has been properly stowed. Boat Managers tell me that all sorts of weird things have been found on our boats. If you use the VHF radio, make sure that you turn it off before you lock the hatch. Batteries can wear down quickly if the radio is left on. As you lock the hatch, make sure that the numbers on the lock are facing the right direction so they can be read easily by the next person. If you've reefed the mainsail, as a courtesy to the next skipper, please untie the nettles and loosen the reef lines so the mainsail can be raised smoothly and easily. Report any malfunctions or repairs needed on the member page of the Sail Chicago website. It's remarkably easy, it only takes a couple of minutes, and it alerts the Boat Managers and everyone who sails the boat after you. If you have an "incident" (see the Sail Chicago Rules and Regulations), immediately report it to the Safety Director. Having a description from you about what happened protects both you and Sail Chicago. Again, this can be done very simply through the member page of the Sail Chicago website. In short, please leave the boat the way you would like to find it. Obviously, this is only a partial list. If you have any comments or pet peeves about what you've found or not found on our boats, please let me know and I'll pass them on to our members in a future issue of Between the Sheets. The end of the sailing season is almost here, we need to be out of the harbors before October 31. The Rhodes, Ideals, and the four remaining Colgates are set to go out of service on October 15. We will motor the boats up the Chicago River on the 17th of October to our winter facility at Canal Street Marina. We are looking for a number of volunteers to help take down the masts on October 15, both for the Colgates and the Ideals. Some volunteers should be experienced, but we can use help from those who are there to learn. If you are interested (and we hope you are! ), send an email to Lois Lawson who is assigning people to the various jobs. Please include your experience level, but, again, we can use people who are at any level of experience. you have gone through the locks before. After the boats are in the yard, we are hoping to get some serious work done to make the Spring launch easier. Anyone can help, we will try to get out there at least one day a week until the weather turns bad. If you want to know if we will be out there working on a particular day, either email me, Tom Peterson, or call my cell, 773-241-4870. We're hoping to get some new people involved in these activities. Don't feel put off if you haven't done maintenance before, we will get you involved as much as you want. And if you have any suggestions let me know when you see me, or email them to me. November 18th. We look forward to an evening of dining and relaxing with friends in this nautical setting. The evening will begin at 6:30 with a cash bar, followed by dinner at 7:00PM. The Board of Directors will be on hand to recognize those who have excelled in the organization, either through their achievement or through their volunteerism. Look for an article in the November Between the Sheets with a link to register and pay for this event. An email announcement will also go out later in October. Space is limited so be sure to register early. The event is open to Sail Chicago members, students, and their guests. This year the fee will be $30 per person for both members and guests. PLEASE RETURN PARKING AND TENDER PASSES! The end of our sailing season is fast approaching, and currently we have two parking passes and several tender passes missing from our lockboxs. Skippers, please check your wallets and sailing gear to make sure that you haven't forgotten to return a pass that you used earlier in the season. Use of these passes is a privilege and on the honor system. If we don't return them by the end of the season, we will be charged for them. That money could be better spent in more productive ways for Sail Chicago. At the end of the season, the passes are automatically canceled and will no longer be usable. Thanks for your cooperation. Think About a River Trip! 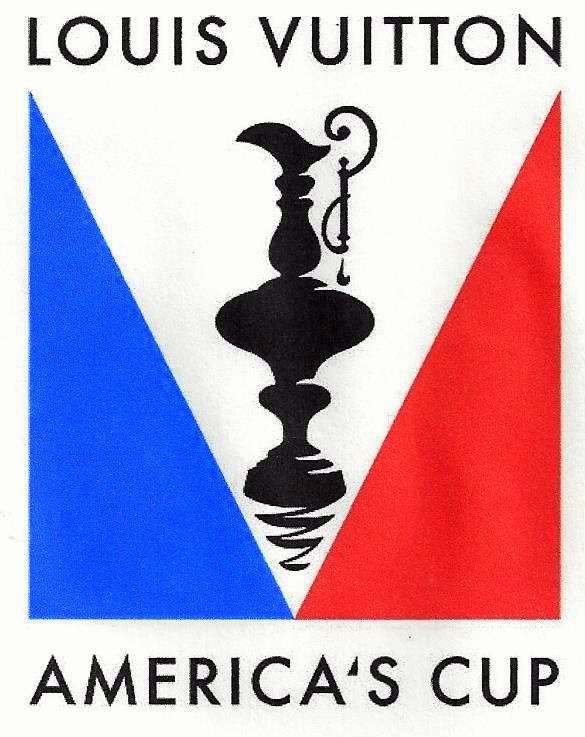 The mission of the US Sailing Community Sailing Committee is to promote and support community sailing in the United States. We recognize diversity as essential to achieving our mission; for us, diversity refers to the differences of culture, ethnicity, race, gender, age, beliefs, religion, socioeconomic status, sexual orientation, family status, physical ability, appearance and ideas. We are committed to achieving greater diversity throughout the sport and fostering an environment that is more inclusive. To help us achieve our mission, we seek to identify organizations that provide the highest quality of education and support access to sailing for all. These are organizations that align with the standards set forth by US Sailing and offer safety, fun, and learning through their programming. Finally, and perhaps most important, is the attitude of our members. We are bound together not only by our love of sailing, but by a desire to pass that love on to others in our wider community through the work that we do in providing quality instruction to our members and students and in offering affordable sailing opportunities for others in the wider Chicago community. We are proud of the service we offer, and most of us work hard at volunteer tasks that promote our mission. It's what makes our own "community" so special! Attention all sailors! We are quickly approaching that time of the year when the weather cools down and sailing season is coming to an end. Each year we take a trip up the river to get our boats out of the water and to the Canal Street Boat yard for routine maintenance work. This year we will be taking two trips. The first one will be late September, early October to move two of our Colgates. The second will be mid to late October to move the last four. Each boat needs at LEAST three members, max of six, to help motor the boats through the locks and up the river. The trip takes about two hours and is a really cool and unique experience. We are even offering incentive this year - $30 in sailing credits to the first three volunteers per boat. Each boat needs at least one skipper certified member but all members are encouraged to volunteer as crew and experience the river trip! If interested for either of the two trips, email me immediately to reserve a spot! If you've got questions, let me know. Exact dates and times will be based on member availability. As we head into the early fall and earlier sunsets, it's important to remember that navigation lights, sometimes called running lights, are an important component of safe boating after dark. The red and green bow lights, the white stern light, and the white masthead light for boats under motor power allow other vessels to see your boat, understand who you are and what you are doing (sail or power) and take proper action to avoid collision. a flashlight at hand to illuminate the sail to avoid collision. It's important for skippers to check both the Fleet Status page in the reservation system and to verify that ALL running lights are operational if sailing after sunset. The Colgates are longer than the 7 meter exemption, thus they must have operating running lights and may not substitute a flashlight illuminating the sail. Skippers should switch to another boat for evening sails if the lights on the boat you have reserved are not working properly. On another note, I was sailing my own boat recently and was boarded by the Coast Guard for a routine safety check. 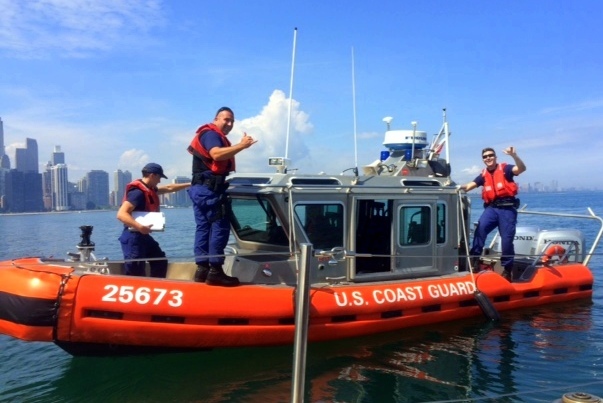 The Coast Guard carries out these inspections to ensure that all boats have the required safety equipment. There is no implication of wrong-doing if you are boarded. The Coast Guard may board your boat without cause. If you are polite and cooperate, you will have no problems. That is, unless you are operating a vessel in an unsafe manner. The Coast Guard asked to see my registration and ID, life jackets for everyone on board, a throwable flotation device, visual distress signal (flares), sound making device, and fire extinguisher (boats with engines). The also inquired about my marine sanitation device (head). Only Priorities is fitted with a head. They were very pleasant, found everything in order, and proceeded to inspect other vessels in the area. Sail Chicago skippers should note that the items on the boat checklists in bold are Coast Guard legally required safety equipment. If any of those items are missing or inoperable, you should switch boats or cancel your sail. The Friends & Family Picnic on the aft deck of the Columbia Yacht Club. Sunday, August 7, will be a day to remember for the lucky Sail Chicago members who attended the organization's annual Friends & Family Picnic and Sail. 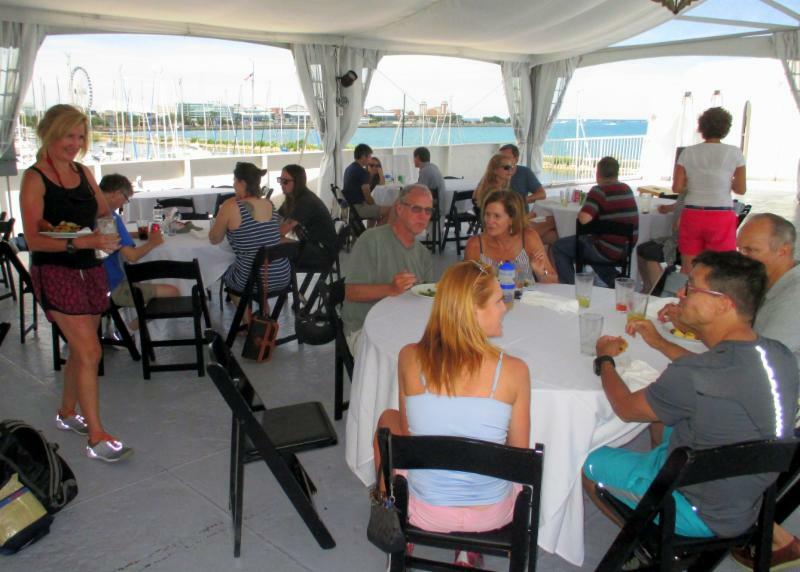 Over 60 members and friends registered for the event, which was held for the first time this year on the aft deck of the Columbia Yacht Club's "big blue boat" anchored in DuSable Harbor. Unlike former picnics that had been held in the past on the grass at Montrose or Belmont Harbors, this was a truly elegant setting. Round tables with linen tablecloths had been set up under a large canopy which kept the hot sun away, but allowed the lake breeze to cool the picnickers. And the buffet was both beautiful and delicious--hamburgers, sausages, grilled chicken, cole slaw, potato salad, mixed fruit, and all the fixin's delighted the participants. Of course, there was also time for members to get their friends and family out for a sail. Three of our Colgates were waiting at the Columbia Yacht Club's private dock to board passengers and get them out on Lake Michigan. Seasoned sailors had a chance to meet old friends, and new members had the opportunity to get acquainted with future sailing buddies. Everyone agreed it was a great time. Many thanks to our Social Coordinator, Sergio Luntsevich, for organizing the event and following through for us. This picnic is just one of the many ways in which Sail Chicago and Columbia Yacht Club are cooperating with one another to enhance each other's programs. Look for more cooperation in the future. We need people to help de-commission the boats. I have created a "boatyard team" to help the individual boat maintenance teams commission and de-commission the boats. This job includes taking down and putting up the masts, the river trip to the boatyard, and work at the yard. You will need to work 5 days to complete service time. The river trip has not been considered service time in the past because it's such a fun thing to do. *Website help--ASP.net knowledge helpful. You need to have a long-term commitment to Sail Chicago. Active participation completes service time. *Fundraising Coordinator and team--Creates and implements fundraising activities Active participation completes service time. *Community sailing skippers and first mates (Laurence Hall, Urban Sail, Schuler Scholars). Must have weekday afternoons available. 5 sails completes service time. *MCO skippers--You may bring your own first mate. 5 sails completes service time. *Tiller Time skippers--You may not bring your own first mate because you need to be confident and competent to give the tiller up to students. 5 sails completes service time. *Assistant program coordinator--Active participation completes service time. *Assistant Coordinator--Helps the coordinator manage boat maintenance. Active participation completes service time. *Boat teams--Helps make and keep the boats in safe, sailing condition. Active participation completes service time. *Repair specialties--Specialists will be called on when needed. Active participation completes service time. *Gas teams--Going out at least 5 Fridays during the season will complete service time. *Boatyard teams--This team is responsible for getting the boats ready for the beginning and end of the season. 5 days of work satisfies service time. 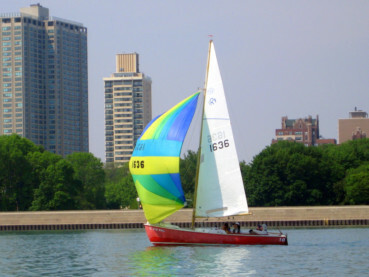 For over 30 years, Sail Chicago has sponsored Urban Youth Sail in partnership with Association House, a community center in the Humboldt Park area of Chicago. 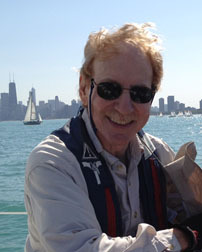 We give young clients of Association House an opportunity to sail on Lake Michigan. It enables the participants to experience Lake Michigan and the city of Chicago in a different way. This year, skippers Mark Fechner and Tim Rice participated in the program. Next year, we hope to schedule the program on a bi-weekly basis (on weekdays to be determined). We welcome both new skippers who can sign up as first mates and get to know the program as well as experienced skippers who want to enjoy weekday sailing with eager young participants. Email Betsy Timm Newton with any questions. We just completed our third season. It was another very successful endeavor. 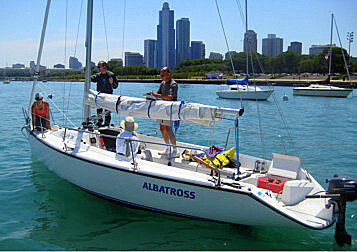 Sail Chicago provided two boats with a skipper and a 1st mate for nine different high schools from the northern suburbs as well as Chicago proper. In all, 70 students were given the opportunity sail. Thirteen Sail Chicago volunteers manned the boats. We are already looking forward to the 2017 season where we can again offer two crewed Colgates on Wednesday afternoonss from mid-June thru mid-August. Also, I would like to offer the schools an extra boat or two if the interest level at a particular school is very high. An American schooler was one of the tall ships visiting Chicago. 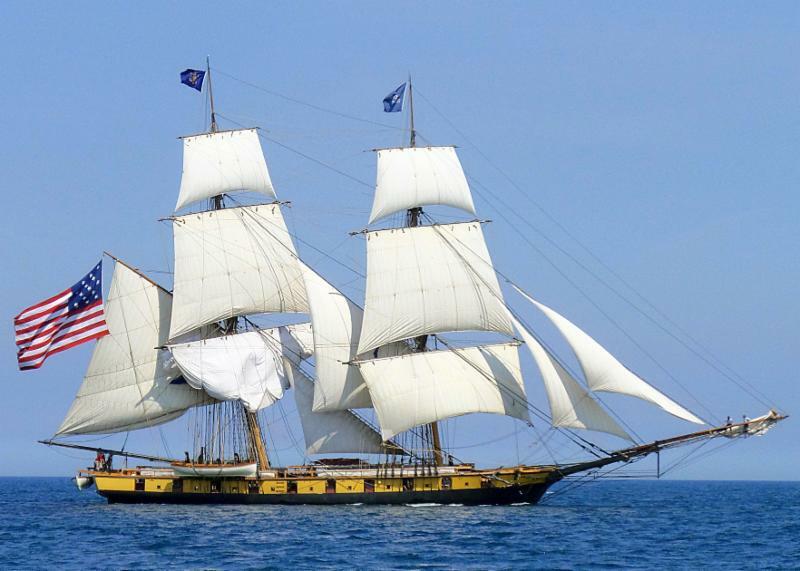 Chicago's Navy Pier once again hosted a Festival of Tall Ships, July 27-31, and many Sail Chicago members were on hand to see them on parade or to tour the ships during the weekend. It was an exciting time to see the sailing ships of yesteryear docked at Navy Pier. There was everything from a Spanish galleon to a Viking longship that had sailed all the way from Norway. Member, Jay Owens, sent us this picture of a visiting American schooner. We look forward to their return in future years. WE NEED YOUR SAILING PHOTOS! Who knows, you might see it reproduced on an 8'X10' banner at the Strictly Sail Show. The Board made a decision to purchase Calypso, a 1993 Pacific Seacraft Ericson 34. Negotiations will begin today. We will keep Priorities through next season to determine the feasibility of keeping two cruisers. Extensive discussions were held to consider optimizing our maintenance procedures. Tom Peterson will begin taking several boats to Canal Street earlier this year to begin prep for next season in the fall rather than the spring. Eclipse, one of our Colgate 26s, was struck by lightening whiile moored at Monroe Harbor and the damage is extensive. It looks like a total loss. A search for a replacement will begin. An electrical engineer will assess our boats to determine if lightening protection is available. I remember back when I was a new member of Sail Chicago. I had a lot of questions about the organization. Where could I get information about reservations, the status of a boat I wanted to reserve for private use, upcoming events in which I could participate, reporting a boating accident or mal-function, finding crew to sail with me, fulfilling my annual service requirement, etc., etc. I found the organization rather opaque and difficult to navigate. I suspect that's also true of some of our newer members today. And yet, I believe that today we have many more information resources available that we did back when I was a newbie. Let's start with Between the Sheets. Our monthly newsletter tries to keep you up to date on a variety of programs, events, and issues in Sail Chicago. Past issues can be a good source of information. They can be found on the Sail Chicago website under "News." Also, the maroon sidebar on the left of each issue tries to keep you up to date on events, who to contact for specific information, and other ongoing useful information. Individual announcements are also published for events happening where registration is often necessary. We try to keep these announcements to a minimum so as not to spam you. If you're not getting them, you may want to search your junk mail folder. If you're looking for crew or would like to crew for others, signing up for Share-a-Sail might be a good bet. You can do it through Google Groups. See the July, 2016 issue of Between the Sheets for specific instructions. And if you're looking for ways to fulfill your annual service requirement, look in the current issue of BTS. You'll find listings of current open positions for which you may qualify. If you have questions regarding your service requirement, contact Christine Garvey, our Volunteer Coordinator. 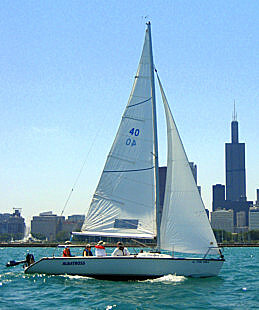 A quick review of the Sail Chicago Rules and Regulations may answer many of your questions about the organization. This online manual covers everything from membership qualifications and registration to use of the reservation system to reporting of boating accidents. It also states our policies on equal opportunity and harassment. You can find a link to the Sail Chicago Rules and Regulations under "Useful Information" to the left. Join us for a picnic and a sail on Sunday, August 7, from 1:00 to 5:00 p.m.! year there's something new and exciting! It's a joint event with the Columbia Yacht Club. We'll picnic on the Club's dock and offer brief sails on boats in our Colgate fleet throughout the afternoon. Come join old friends and meet new friends. We're planning to offer sails on our Colgates. We need Colgate skippers who can set aside time to take folks out for a short sail. If you can help out, please let me know as soon as possible. This is a great opportunity to get your non-sailing friends and family out on the water for a brief sail. Enjoy a delicious buffet lunch complete with 1/2 pound hamburgers, all beef hotdogs, grilled chicken breasts, potato salad, cole slaw, fruit, dessert, and all the fixin's. There's a $10 per person charge for Sail Chicago members and guests ($5 for all kids under 12) to cover the cost of the food. The fee is non-refundable. In the event of rain, the buffet will be moved to the aft deck of the Club. Come early to register for a sail on one of our Colgates. Stay late to share sailing stories and have a good time. To register, click here. Join other Sail Chicago members and students on Thursday, August 25 from 6:00 p.m. Meet new friends, reconnect with old sailing buddies, and compare your best sailing stories! restaurant and tavern, located conveniently in the South Loop. Walk, bike, drive, or take public transit-just make sure to come! The Weather Mark is easily accessible by bus and train, and "pay at the box" street parking is available.Thursday specials include half-price select appetizers. Thursday drink specials are $15 domestic buckets. In addition, for Sail Chicago members only, $5 Skyy Vodka and $5 Mt. Gay Rum drinks. For those who would like to participate, Team Trivia Night begins at 7:30 PM. This should definitely be a fun evening! Don't miss out on this night of food, drinks, and fun! Bring your family and friends! There is no entrance fee for this event, but we do need to know how many people are coming! Please register here. Thanks so much to Michael Johnson for stepping up to coordinate the gas team. We all love getting on a boat that has gas, right? Often the maintenance teams are busy doing maintenance, so it has been difficult to also fill up. Right now, the boat teams are taking gas team responsibilities until we can develop a team of its own. If anyone is interested, please let me know. The boats are gassed up on Friday evenings. We are continuing to look for some important positions to be filled. We need assistants for Instruction and Maintenance. It's a wonderful way to meet members and learn new skills. We are also attempting to delegate the work so it's not too much work for a few people. Our website transition team also needs help. An effective website is key to the organization's success. So, if you are interested or need more detailed information, please contact me. *Website help -ASP.net knowledge helpful. You need to have a long term commitment to Sail Chicago. Active participation completes service time. *Fundraising Coordinator and team - Creates and implements fundraising activities Active participation completes service time. *MCO skippers - You may bring your own first mate. 5 sails completes service time. *Tiller Time skippers - You may not bring your own first mate because you need to be confident and competent to give the tiller up to students. 5 sails completes service time. *Assistant program coordinator - Active participation completes service time. *Assistant Coordinator - Helps the coordinator manage boat maintenance. Active participation completes service time. *Boat teams - Helps make and keep the boats in safe, sailing condition. Active participation completes service time. *Repair specialties - Specialists will be called on when needed. Active participation completes service time. * Gas teams - Going out at least 5 Fridays during the season will complete service time. Last call for interested racers to sign up for the August racing session! We have been having a great time. Weather has foiled us a couple of times, but there is always free beer on tap at Columbia (rain or shine!). Intermediate sailing level or above is the prerequisite. Sign up here or contact Maya Teleki if you have any questions! Also this month is the Inshore Verve Cup Regatta on August 27 & 28. This is the signature event of the racing season, so find some sailing partners and sign up. Thanks to a team effort from the Instruction and Maintenance teams (hats off to Tim Ryan and Tom Peterson), and with approval from the Monroe Harbormaster, we have set up a practice mooring can in the transient mooring area near the south end of the Harbor mouth. The idea is to provide a place to practice the Close Reach approach to a can safely away from other moored boats and the busy west channel, but realistically with mooring cans and the east channel as elements to consider. The transient cans are marked with orange tape and generally do not have numbers, but this one (marked number 2), is approximately 3 cans south of the harbor mouth and 3 cans west of the east channel break-water. "Sail Chicago Practice" is marked on the weathered wand itself and includes a long, sturdy line between the wand and two functional mooring lines. A brass hook attaching the two mooring lines to the wand tether should be easy to handle in the event you need to use the mooring can in an emergency situation. As always, try to avoid sailing in between boats, use the aisles and outer channel and try to avoid the inner channel due to fluky winds and heavy motor boat traffic. Finally, keep in mind that this practice mooring can might be a good option as a safety retreat in heavy weather instead of going back to the boat's home mooring. Optimizing the maintenance process We depend too heavily on a few very dedicated sailors to keep our fleet in service. Tom Peterson and Shawn Lord will be working with the boat managers to develop the haul-out plan, streamline spring plans and consider bringing back the summer maintenance program. We need more help. We welcome ideas. Website Our web master is moving to the west coast. Alfred Chan has developed a very specific software program that handles our on-line activities in a marvelous way. Shawn Lord and Martin Modahl will be working with Alfred to learn the system. We still need someone with ASP.net coding expertise. Up-grading our cruising boat A team is searching for a newer cruiser. The criteria for a new cruiser include; being well-built by a quality builder, 1993 or later model, excellent condition with no deck cracks or stained cabin cushions, sleeps five, cost under $60K, and 34-36 feet in length. The team has looked at a Pearson 36, Beneteau 34, Ericson 34, and Catalina 32. The leading candidate is the Ericson 34. Social Activities Report Our new social chairman, Sergio Luntsevich, reported on activities that include our annual picnic at Columbia Yacht Club on August 7 and monthly happy hours at the Weather Mark on the last Thursday of each month. Safety John Lemon reported on six incidents that occurred during the month; each involved mooring under sail in high winds. Matt Stuczynski reminds all skippers that the cautious sailor approaches the mooring with sails up and the engine running and, doesn't go out in weather that is beyond his/her experience. Matt also reduced the top winds in our wind guidelines which were sent to each skipper. Believe it or not, we're almost at the mid-point in our sailing season. Although May wasn't particularly hospitable for sailing, June turned out to be, for the most part, beautiful. If tradition holds out, the rest of July and August should be great sailing weather. It's been a good year so far. Membership is up over last year, and our boats seem to be getting a lot of use. Thanks to our many volunteer instructors, our mission to "...to offer quality instruction in sailing and boating safety..." is being fulfilled. Our classes are full and waiting lists abound. If we had more qualified instructors, we could be offering more classes. Our hope is that our enthusiastic new skippers this year will consider becoming instructors in a couple of years in order to pass on their experience, knowledge, and love of sailing to other new students. Because we are an all-volunteer organization, our member-volunteers are our life-blood. They are the ones who keep the organization going. Recently three members have stepped up to fill major positions left vacant by former members who've moved out of town. Brandon Sanders is our new Member Cruise Outing Coordinator. MCOs provide our members and friends an opportunity to sail on a boat with an experienced skipper in an easy-going social atmosphere. Chris Faris is our new Tiller Time Coordinator. 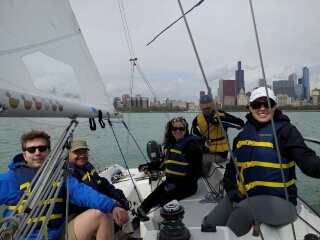 Tiller Time is an opportunity for our member-students to get additional time on the water with experienced Sail Chicago skippers who help them to practice the skills they learn in their formal instruction programs. Sergio Luntsevich is our new Social Coordinator. He's responsible for planning and executing activities that bring our members and friends together in a friendly and social atmosphere. He's already organized a series of "Happy Hours" at the Weather Mark Tavern and Grill (see article in this issue), and is busy planning our annual picnic in August. Rumor has it that this year the picnic will have some exciting new features. Look for more information in announcements and the August issue of Between the Sheets. 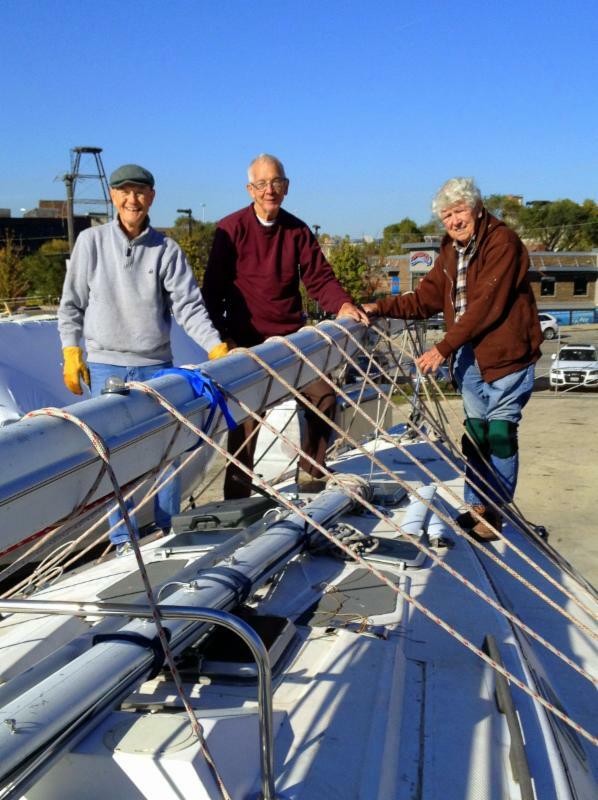 These are only three of our member-volunteers who put in countless hours making Sail Chicago a great sailing community. Committee members, maintenance staff, instructors, and everyone involved invest much of themselves in the organization throughout the year. For them and their service we are very grateful. We still have openings available (see article in this issue). Please consider volunteering where your talents can be best used. Maintenance is creating a new "Gas" team. This team will go to the Columbia Yacht Club on Friday evenings and go out with their RIB driver to fill up all the gas tanks on our boats. Members of the existing teams can join this specialized team and/or non-team members can simply join this team. If you are a non-team member and participate in the gas team for your service time, you will need to go out 5 Fridays to complete your service time. We will also need a coordinator for this team who will do the schedule. The coordinator will receive $100 in sailing credits. *Assistant treasurer - This person needs to enjoy doing their own financials/taxes and be committed to the organization. Active participation satisfies service time. Tuesday, July 26, from 6:00-8:30 p.m. Please respond here if you would like to attend. Join other Sail Chicago members and students on the last Thursday of each month for a Happy Hour at the Weather Mark Tavern. Our next get-together will be Thursday, July 28 starting at 6:00 PM. Meet new friends, reconnect with old sailing buddies, and compare your best sailing stories! The Weather Mark is everyone's favorite nautical-themed restaurant and tavern, located conveniently in the South Loop, 1503 South Michigan Ave. Walk, bike, drive, or take public transit-just make sure to come! It's easily accessible by bus and train, and "pay at the box" street parking is available. Thursday specials include 1/2 price select appetizers. Thursday drink specials are $15 domestic buckets. In addition, for Sail Chicago members only, $5 Skyy Vodka and $5 Mt. Gay Rum drinks. Also, for those who would like to participate, Team Trivia Night begins at 7:30 PM. This should definitely be a fun evening! Don't miss out on this night of food, drinks, and fun! Bring your family and friends! There is no entrance fee for this event, but we do need to know how many people are coming! Click here to register. Skipper MCOs for extra fun. The Member Cruise Outing program gives members an opportunity to get out on the water for a free sail and bring along their friends at a small cost. It's a great way to practice your boating skills and get to know others in Sail Chicago, and it's just another great benefit of membership. We need qualified Sail Chicago Skippers to sign up for MCOs. A skipper can bring along a first mate. And skippering five MCOs satisfies your service time for next year. If you'd like to volunteer as a skipper, please contact me by e-mail. I will try my best to accommodate last minute requests, however 2 business days is preferred. Your crew or extra skipper may be waiting for your message. shanghai crew. An easy way to get eager, skilled crew is to use Share-a-Sail. Find it on Google Groups. Sign up with your full name, so members can recognize you,and then send and receive emails as to when you are available to sail. It's a great way to get more time at the tiller, gain sailing experience, and lower the cost. See you on the lake. Any questions, email me. Due to some heavy and gusty winds this season, our Safety Director, John Lemon, our Program Director, Michael Swisher, and I want to remind you of the Sail Chicago traditional wind guidelines (below). Most importantly, choosing to go out depends on your best judgment, crew and skipper capability, experience, wind direction, wave height, etc. The usual rule of thumb is to reef if anyone on the crew even thinks it might be a good idea. 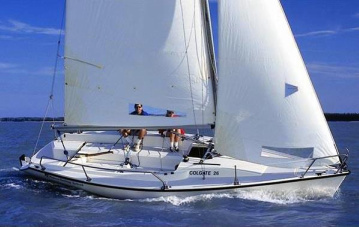 The Colgate 26 reaches hull speed when winds reach about 12-13 knots, so it should probably be reefed at any higher wind speed. 0-10 knots (Gentle Breeze): Full sail can be raised. Crew should have completed the Basic Sailing Course or equivalent. 11-16 knots (Moderate Breeze): Sail should be reefed at higher-end 13-16 knots. Crew should have completed the Intermediate Sailing Course or equivalent. 17+ knots (Fresh Breeze): Responsible skipper should cancel unless with another Sail Chicago Skipper or equivalent. Remember, too, that first-year skippers MUST have at least one other experienced skipper or equivalent on board on any sail during their first 12 months. Having another experienced sailor on board will help you best plan and execute in challenging conditions. In the harbor have fenders out and ready for possible fending off. Retreat to the safety of an empty can (maybe to our new practice can) at the harbor entrance if conditions exceed your capabilities. To schedule an on-the-water Ideal 18 or Rhodes 19 orientation session, visit the Sail Chicago website and select Seat Availability from the Reservation menu. There should be some sessions listed under Orientation. To request that a Rhodes session be scheduled for a different date/time, please contact Tim Rice. For a different date/time for an Ideal orientation, contact Peter Dudak. Are you a new skipper who would love to take your family or friends out for a cruise on Priorities, but hesitate because you're not sure you can handle whatever the lake throws at you? skipper who will accompany you and your guests out onto the lake. Plan your cruise as you would normally by checking available Priorites dates on the website. Then call or email any or all on the following list of volunteer skippers to see if one is free for that day. There is no additional cost beyond the rental. The philosophy of the program is to provide you as skipper with back up to help you handle situations you may have never encountered previously. If anyone reading this is experienced and willing to be added as a Back-Up Skipper, please let me know, and you will be added to the list. Our 2016 summer sailing season is in full swing. Classes are full, Tiller Times, and Member Cruise Outings are being scheduled, and plans for summer social activities are well under way. Perhaps it's time to take a few minutes to look back on our history--where we've come from, and, more importantly, where we're heading. Sail Chicago was, for many years, a division of American Youth Hostels. About fifteen years ago, AYH decided it wanted to concentrate on hosteling, and it closed down most of its ancillary activities, like the sailing program. 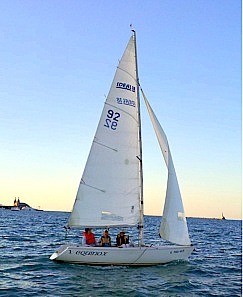 In 2003, the AYH members who wanted to continue the sailing program formed an Illinois corporation with the name Sail Chicago, and they purchased the boats, mostly Rhodes 19s, from AYH for a nominal sum. For the first 7-8 years of its life, Sail Chicago operated pretty much as a private, members-only sailing club. There was no permanent staff. Member-volunteers did all the maintenance work on the boats and ran sailing classes for the newer members during the summer sailing season. 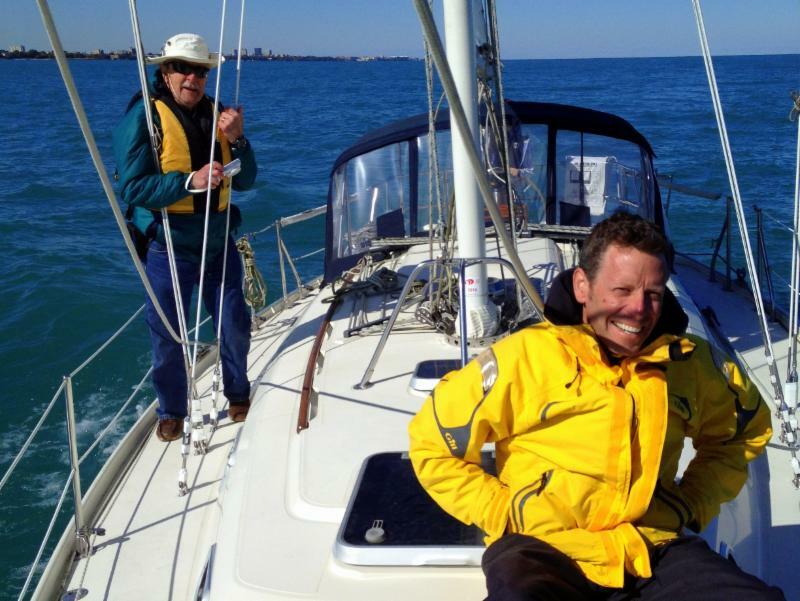 Then, about 5 years ago, under the strong leadership of its Chairman and Board of Directors, Sail Chicago began some fairly radical changes that transformed it into a true community sailing program. It developed a mission statement (see under "Mission" on the masthead to your left) that placed a strong emphasis on sailing and boating safety instruction. It received a 501(c)(3) not-for-profit designation from the Internal Revenue Service. It began a fleet renewal program that ended up making the Colgate 26 the boat of choice for our instruction program. It expanded the instruction program and opened it up to non-member students. 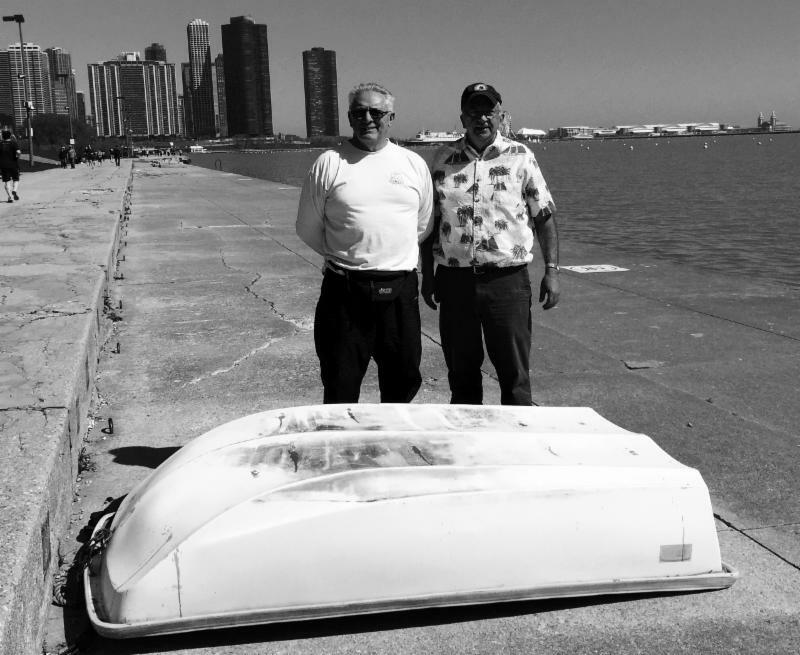 It started a successful Colgate Racing program that is now a part of the long-standing Wednesday evening Chicago "Beer Can" races on Lake Michigan. It formalized an affiliation with U.S. Sailing, a national sailing organization that promotes sailing and sailboat racing throughout the United States, and it now offers U.S. Sailing certification to qualified students. What about the future for Sail Chicago? Recently the Columbia Yacht Club has formed a separate not-for-profit organization for its instruction program. 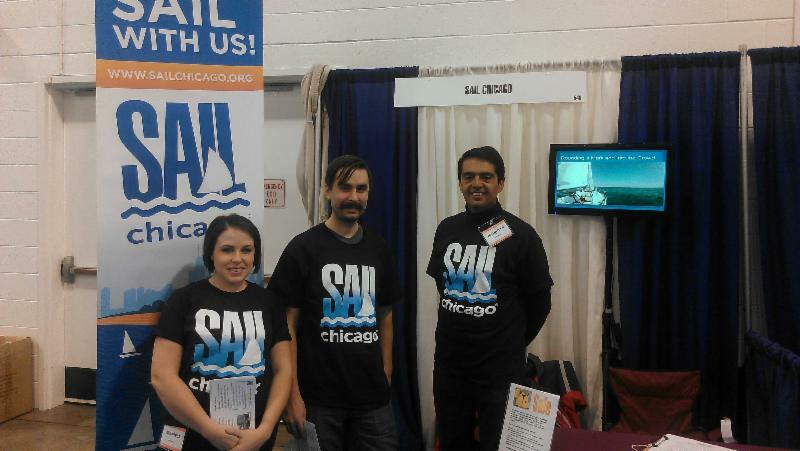 Sail Chicago is exploring a closer affiliation with them. We are finding many areas of synergy that could benefit both organizations. See the article in this issue. We have maintained our tradition of strong member-volunteer involvement, and, as an all-volunteer organization, we expect all of our members to explore ways in which they can promote our mission. We always have areas of work in which our members can participate. Right now, one of the main impediments to our future growth is a lack of qualified member-volunteer instructors. If we had more instructors, we could offer more classes to our students, and we could do a better job at fulfilling our mission. If you'd like more information regarding how to become an instructor, contact our Lead Instructor, Matt Stuczynski. Our webmaster, Alfred Chan, has notified us that he expects to be moving out of the State by the end of the year. We cannot thank him enough for all the time and energy he has put into our website. He will be missed! A transition plan is being developed. If you are an ASP.net web developer, please consider joining the team. This person would fix bugs, add features, and keep our site flexible to meet the demands of the organization. Also, our instruction coordinator needs an assistant. Remember, a large part of our revenue is obtained from classes. The cost for these classes help keep rental costs low. It's a big job at the start of the season and an assistant is needed to help coordinate and communicate with students and instructors. We have a new Social Coordinator: Sergio Luntsevich. He is very excited about taking on this role and meeting our members. He can always use help planning parties so if you are interested contact Chris Garvey. We also have created a new position of Archivist, and Rebecca Holloway and Dolores Baron have taken on this role. They will be going through old documents and talking to members to collect information on our history. Another new position is Fundraiser Coordinator and team. Sail Chicago is 501c3, so donations are tax deductible. This position is open to be developed, but could start with a silent auction at our end of the year party. Anyone up for it? Our boat teams have been starting to fill up nicely, but we still have open boat team positions. We are attempting to break down the jobs so all the work does not fall on a few people. If you have knowledge in special areas such as motors, electrical, painting, plumbing, or rigging, please notify the service time coordinator. You will be called up as repair experts when needed. We also need an assistant coordinator for maintenance. This job would mostly be administrative, helping the coordinator organize and communicate with boat teams. Right now, service time jobs will be listed in Between the Sheets and with the service time coordinator. We no longer have the jobs list on the website. The coordinator would like service time to be a win-win situation and will work with members to get a good fit. Personal contact is usually best to get this result. *Website help -ASP.net knowledge helpful. You need to have a long-term commitment to Sail Chicago. Active participation completes service time. *Social committee members - Helps plan parties. Active participation completes service time. *Curriculum help - We need someone with experience in word processing and graphics. Active participation completes service time. 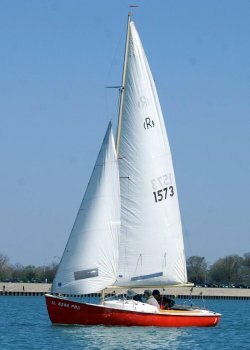 other Sail Chicago members who would like to get together and go sailing. Both members and non-member students can participate. Get more time on the lake. 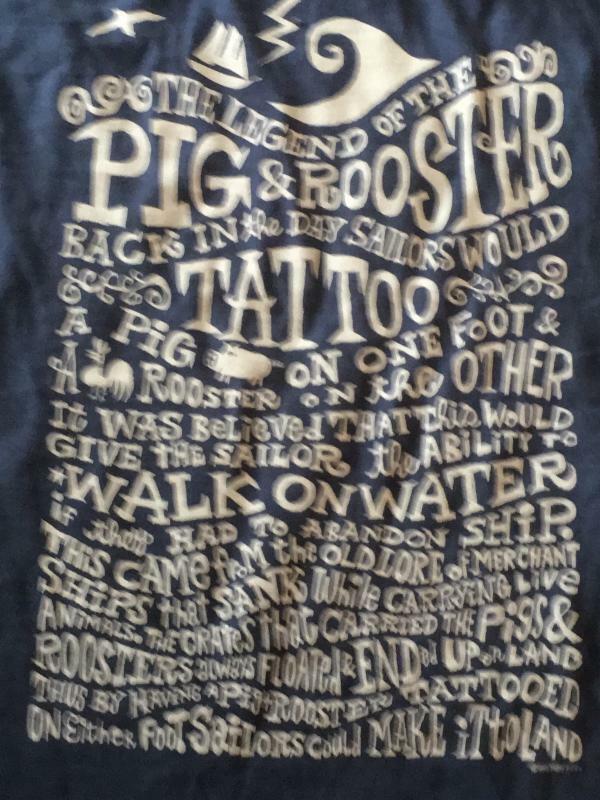 You won't have to sit on shore or shanghai crew. Non-sailors are often undependable or prone to mal de mer. An easy way to get eager, skilled crew is to use Share-a-Sail. Find it on Google Groups. Sign up with your full name, so members can recognize you and then send and receive emails as to when you are available to sail. It's a great way to get more time at the tiller and gain sailing experience. Saturday, June 25th from 10-12:30 a.m.
Tuesday, July 26th from 6-8:30 p.m. Please respond here if you would like to attend either session. sails out on the lake and wished that you could sail with one? Now you can by signing up for spinnaker classes being offered this summer on July 10th, 17th and 24th. If you would like to take the class but Saturdays would work better for you please contact me. The classes consist of three lessons and cost $100. You will learn the skills involved in all three spinnaker positions: the deck work of manning the spinnaker pole, the cockpit work of rigging, raising, flying and lowering the spinnaker and the skipper responsibilities of keeping the spinnaker filled and jibing with the spinnaker. Qualifications to take the class: Completion of Intermediate sailing class or Rhodes or Colgate skipper. To register for the class please visit the "Learn" page on the Sail Chicago website. Last month, we looked at a series of Navigation Rules that set the general framework for encounters between vessels. This month we will review the specific Rules that govern the three possible situations that have the potential for collision: overtaking, crossing, and meeting head on. Rules 11 through 18 govern "Conduct of Vessels in Sight of One Another". Let's take the easiest one first: overtaking (passing). Rule 13 is crystal clear on this--the overtaken vessel has absolute right of way in all situations, regardless of whether the overtaking vessel is a powerboat or sailboat or ocean liner. Further, the rule emphatically states that the overtaking vessel may not become a crossing vessel and then exercise rights over the overtaken vessel. The overtaking vessel must stay clear "until she is finally past and clear". If you are not sure you are in an overtaking situation, assume you are and act accordingly. There are two rules that govern crossing situations: Rule 12--Sailing Vessels, and Rule 15--Crossing Situation. 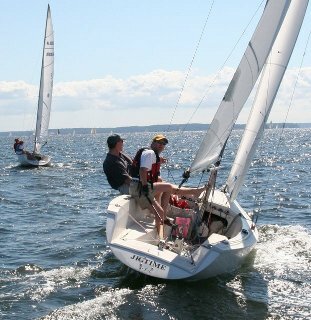 For sailboats, there are two possible situations: crossing on opposite tacks and crossing on the same tack. In the first case, the sailboat on starboard tack has the right of way over the sailboat on port tack. For sailboats on the same tack, the windward (upwind) vessel must stay clear of the leeward (downwind) vessel. For powerboats crossing each other, the vessel on the right has right of way, and the give-way vessel is encouraged to go astern of the stand-on vessel. Note that sailboats motoring, even if a sail is up, follow the rules for powerboats. This is sometimes called the "red light rule" since the give-way vessel (on the left) will see the red (port) navigation light of the stand-on vessel. Rule 14 - Head On Situation--applies to power driven vessels. This is the only case in the Rules where neither vessel has right of way. Both are required to alter course to avoid collision, and they are encouraged to alter course to starboard so they pass port-to-port. Again, a sailboat under motor power must follow this rule. Two sailboats meeting head on are governed by the Rule 12 starboard/port tack situation. What is required of a skipper if the possibility of collision exists in any of these situations? Rule 16 requires that the give-way vessel "take early and substantial action to keep well clear". Make your intentions clear. Rule 17 states that the stand-on vessel keep her course and speed. In other words, don't make the give-way vessel guess what you are doing. If it appears that the give-way vessel is not following the Rules, the skipper of the stand-on vessel may maneuver to avoid collision. If everyone on the water followed these few simple rules, most collisions would be avoided. Key to a fun and safe sail: keep a lookout, be aware of your event horizon, and always be prepared to maneuver in accordance with the Navigation Rules. You can study the Navigation Rules here. sure to reserve it early. Also, while on the water, be particularly vigilant. The in-shore area of Lake Michigan will be very crowded with other boats during the weekend. Also, the America's Cup boats that will be racing are extremely fast and very large. You don't want any nasty on-the-water surprises during your sail. An On-Water Guide has recently been published. It should give you most of the information you will need to enjoy the weekend. To review the Guide, click here. Discussions with Columbia Yacht Club about ways in which our two organizations might coordinate efforts and work together are continuing. It turns out that there are several areas of potential common interest. Bob Lapin, our Cruising Coordinator and current Board member, recently attended one of those discussions. Click here to review his summary of that discussion. Our Instruction program is now open for business, and if history is any example, classes will fill very quickly. If you're interested at all in taking any classes, I'd suggest that you sign up as quickly as you can if you'd like to get your most-desired dates and times. Recent years have seen significant changes to our Instruction program. Sail Chicago has moved from a small sailing "club" to a true metropolitan community sailing program. Instruction has become a major area of focus, not just for our members but for the entire Chicago community. We are committed to enhancing safe sailing opportunities for everyone in the Chicago area. In the past couple of years we have formed a much closer relationship with U.S. Sailing, an umbrella organization that promotes sailing and sail-racing opportunities across the nation. We teach according to U.S. Sailing standards, and we offer U.S. 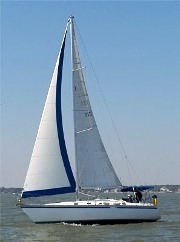 Sailing basic keelboat certification to anyone who is able to complete our Intermediate Sailing course and pass a U.S. Sailing written exam. Our Cruising program is also unique among community sailing organizations. Very few such programs offer the opportunity to take a coastal navigation course or to participate in port-to-port cruising instruction. Our Cruising program has also expanded dramatically over the past couple of years. Look for some new course offerings on our website. Currently we are looking at new ways that we can partner with the Columbia Yacht Club. We have found many areas of common interest, and we are exploring those areas where we can be of mutual benefit and assistance to each another. This is an exciting new initiative and one that could significantly benefit both of our organizations. Stay tuned for more on this exciting opportunity. Of course, none of this would be possible without the full support of our member-volunteers. We are one of the very few community sailing programs in the nation that has no paid staff. What we do have, however, a group of people who are passionate about sailing and who want to share their enthusiasm with others. But an all-volunteer organization can also have an occasional downside. Sometimes things don't happen as quickly as we would like, and occasionally stuff can fall through the cracks. On the other hand, our volunteer spirit has allowed us to keep our costs extremely low while at the same time providing adequate funds to sustain our continuing fleet maintenance and renewal programs. We look forward to seeing you all "on the water" this coming sailing season! Our summer sailing classes are now open! Check out our many course offerings here. There are a wide variety of courses open at all levels of sailing competence. Remember, once you successfully pass your Intermediate Sailing course, you become eligible to take the U.S. Sailing written exam and receive your Basic Keelboat Sailing certification. As always, however, if you want to become eligible to sail our boats on your own, you must complete the Skipper Prep class, which teaches those skills. Don't delay, though. Our courses tend to fill up very quickly. To maximize your choice of dates and courses, act now! Our fleet should be in the water and ready to sail by May 1, but before then there's a lot of work to be to make sure that they're seaworthy. You can help! During the next few weekends, from now until April 17, we'll be at the Canal Street boatyard*, Saturdays and Sundays from 9:00 a.m. to 2:00 p.m.
our boats shipshape. As an added benefit, you'll learn a lot about what it takes to maintain a sailboat, and you'll meet other members with whom you can go sailing this summer. Jobs will range from sorting gear, to cleaning, painting, and waxing. Can't make the whole day? Come for part, lend a hand, and learn something, too. Questions? Contact Tom Peterson or Shawn Lord. * The Canal Street Boatyard is near Chinatown, just north of Cermak Road on the east side of the south branch of the Chicago River. Learn the complicated dance of raising the mast on a 26-foot Colgate sailboat! April 23, 9:00 a.m. - 4:00 p.m. is the date (April 24 rain date). Columbia Yacht Club at the north end of Monroe Harbor is the place. This is the final step in getting our boats ready for the summer sailing season. Treats will be provided. If you're planning to join us, please RSVP here so we can keep you updated. Questions? Contact Tom Peterson or Shawn Lord. For those who have thought about being a Tiller Time skipper and, maybe even being involved in Instruction, we are offering the chance to bone-up on some basic sailing skills as well as learn some tips and tricks for being an effective Tiller Time skipper. We plan to offer two sessions, in conjunction with our Pre-Sail Orientations (PSOs) on the following two evenings: Tuesday, April 26th from 6-9 p.m. and Thursday, May 19th from 6-9 p.m. Please RSVP here if you would like to attend. We look forward to some informative talk at Tiller Time Training! 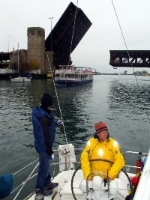 Sail Chicago's cruising program will hold a second coastal navigation class on April 23 and 30. The class will be held in a downtown office building with state-of-the-art facilities. This class is a prerequisite for anyone wishing to enroll in this season's Bareboat Cruising course which plans and conducts a weekend sail to a foreign port. Last season's cruises went to Waukegan and Michigan City. Click here to register. just $350. If you are interested, please contact Bob Lapin, and we will work out the details. 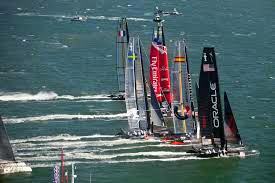 A pass has been purchased that permits Priorities to raft-up on the periphery of the Louis Vuitton America's Cup World Series race course and observe the races on June 10-12. These are races held around the world to identify a challenger for the cup race in Bermuda in 2017. Check out this one-and-half minute video, and I'm sure you will not want to miss it. Sign-up opportunities will be presented in the May BTS. The US Coast Guard recently approved the use of electronic charts (nautical maps) in lieu of paper charts, maps, and nautical publications. This was done in recognition of the Coast Guard's belief that "official electronic charts provide substantially more information to the mariner, and therefore may enhance navigational safety beyond that of official paper charts. Official electronic charts can provide the mariner with substantially more navigational information than a paper chart." A little background is required. The Coast Guard requires all commercial ships to carry a complete set of up-to-date charts, along with other publications such as the Coast Pilot and Light List. Keeping the charts up to date is a time-consuming manual procedure. In this electronic age, charts published by the National Oceanographic and Atmospheric Administration (NOAA) are updated electronically on a regular basis. NOAA states that their electronic charts meet the standards of nautical charts required by the Coast Guard. Further, NOAA stopped printing charts in 2014 and has switched to print-on-demand. The prudent mariner never relies on only one source of navigational information. Thus, the Coast Guard requires ships that do switch to use of electronic charts have a backup of either traditional paper charts or a completely independent second electronic system. As recreational boaters, we are not required by the Coast Guard to carry nautical charts. As I noted, the new rules only apply to commercial ships. As prudent mariners, many of us do have GPS receivers and/or carry paper charts, and we should use them. Before you decide to burn all of your paper charts, consider that paper charts remain an excellent primary (or secondary) navigation system. Being able to read and understand a nautical chart is a valuable skill, and you can learn that skill from Sail Chicago through our course on Coastal Navigation. You can read complete US Coast Guard letter and standards here. Sail Chicago will have essentially the same moorings at Monroe Harbor that it had last year. For a diagram of the moorings at the south end of the Harbor, click here. John Lemon, our Safety Coordinator, points out that there will be more open areas to the south and east available for maneuvering, depending on other activities in the harbor. The area to the east will be for transient moorings, and the area to the south will be for special events. Remember, when leaving the Harbor, never leave from the south channel. It's narrow and shallow. Always depart using the main fairway in the center of the Harbor to the north of where our boats are moored. Use of the outer (east) channel is recommended, to avoid powerboat traffic in the inner (west) channel. d built and sailed from Hong Kong to Florida in the early 1960s. While they had all been in the Navy, none had had any significant experience on a sailboat. In those days there was no GPS, so they had to navigate by sextant. Steve told the group that such a voyage today would be much too dangerous, especially along the African coast and up through the Red Sea and the Suez Canal. At the time of their adventure, there were still remnants of the British Empire across the southern ocean, and they were saved from potential trouble several times along the way by British officials.